Let us start by complaining of one aspect of the road test example of what was otherwise a delightful quality small/medium size car with standard fittings that were unthought of even 10 years ago writes Malcolm Ginsberg. This quick (134mph and 0-60 in 7.8sec, Jaguar XF performance) Astra came equipped with a six-speed manual gear box. Whilst clearly very well engineered this means that you are forever using your left leg and taking one’s hand off the steering wheel. It might be a little more expensive on fuel but if you decide on what is a very good product, go for the auto version. A very short run in another example showed that the auto box is up there with the best. The Vauxhall Astra has been produced at Ellesmere Port near Liverpool since 1981 by the British division of General Motors. With its Opel cousin it is now in its seventh generation. Three million have been built. It was the last car to be used in the Top Gear’s ‘Reasonably Priced Car’ test course, the series abruptly ended with Jeremy Clarkson’s departure from the BBC. In 1981 it was a bit basic, a sort of shortened shooting brake (as we called them), or a modest sized estate car. The Astra has come a long way since those far off times. Today it is a sleek mid-market family auto with all the latest ‘toys’ available. As with all automotives in 2017 there is a bewildering range of add-ons available and if you are a buyer the norm is probably to what the dealer has in stock, or can obtain easily. The alternative is to wait several months with perhaps less of a chance to haggle a price but get the perfect specification wanted at the time of ordering. In any event this loan model came pretty well equipped with 8” sat-nav, cruise control and what is called the Driving Assistance Pack, featuring an intelligent forward camera system, with lane departure warning, traffic sign recognition, following distance indicator and a collision alert with automatic city impact braking. The lights atop the dash reflect on the inside of the ‘screen if the car’s in-built camera detects that a front collision is likely. We are told that it is 200kg than the previous model and sits lower. All this adds up to a package that together with cruise control gives for relaxed motorway running. The Astra is a fastback. It sort of always was but the 2017 model is much more sporty. The first thing you notice is the quality of the interior finishes. With sports style front seats once you have sorted out your driving positon everything falls to hand very nicely. Back seat passengers will not be disappointed with plenty of leg room offered and a central backrest that can fold down to carry long items, or be used as a table. All three backrests can if needed lie flat but in any event the boot size is a class leader. The fabrics which are used for the seats show that leather is not always the answer when It comes to choosing what to sit on. The test car was without the seat massage and ventilation facility nor the ‘park assist’ facility. What a pity. 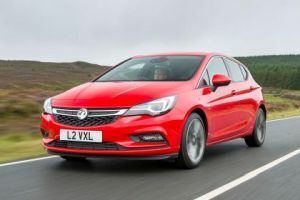 When it comes to handling the Astra is zippy two up, quiet at 70mph, and neat when a degree of handling is required, such as a roundabout or a sharp left turn. Across the country the average road surface has deteriorated over the last five years so that even in town they are little more than cart tracks. The 17” wheels soak up the bumps nicely but coupled with more and more sleeping policemen driving in built-up areas is no longer a pleasure. It cost just over £1,000 as an extra but the IntelliLux LED matrix headlights fitted on the test car are a breakthrough when it comes to improved night visibility and safety. A camera fitted to the back of the driver’s mirror captures the traffic situation and controls the light accordingly. It starts with full high beam. If there’s oncoming traffic, the light shining in its direction will be masked out. The same happens if the camera picks up a car ahead. The IntelliLux system rather sums up this latest Astra. With this it is a car ahead of its time and a serious contender in a class that has some very fine competition. Put a German or executive Japanese badge on it the price would be much more. Except for the gearbox, which may be good but was hard work, it could finish up this year being the best seller in its class. "We are told that it is 200kg than the previous model and sits lower" Lighter? Heavier? Happier?